the St Vincent's Industrial School for Roman Catholic Boys was opened in 1872 at Brunswick House, 124 Tanner's Hill, New Cross, south-east London. The building was an old house, with a wing added and a good playground. It was formally certified to begin operation on February 9th, 1872, with accommodation for 40 boys. Initially, Mr and Mrs Meany were appointed as superintendent and matron. From 1873, however, the School appears to have had a resident 'manager' in the shape of the Rev. S.A. Donnelly. Considerable additions were quickly made to the buildings increasing its capacity to 80 places. Tailoring and shoemaking were provided as industrial training. Former St Vincent's Industrial School, 124 Tanner's Hill, New Cross. In 1876, Rev Donnelly resigned his post and the School was run by Brothers of the Order the Presentation from Cork, with Brother L.I. Keogh as manager. In August, 1878, the School relocated to purpose-built premises at St Vincent's Lane (now Temple Hill Square), Dartford, where 200 boys could be accommodated. The new building was formally certified for use on July 31st, 1878. A chapel and school room were completed in 1880. The layout of the site is shown on the 1897 map below. St Vincent's Industrial School site, c.1897. 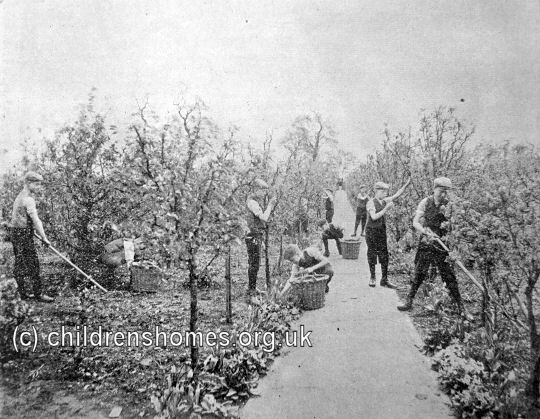 Tailoring and shoe-making continued as before, and the 25 acres of land around the new house provided a good supply of gardening work for the boys. A junior class knitted and darned and carried out repairs. A School brass and reed band was established and the boys were regularly drilled. A new superintendent, the Rev. James Shanahan, took over in 1882. A report on the School in 1896 described the building as airy and well-lit, and heated throughout by pipes. There was a separate dormitory for the younger boys under the charge of a nurse. About 10 acres of the School's land were under cultivation with fruit, vegetables, a little grain, and roots, and the rest in grass. The stock consisted of 5 milk cows, 2 horses, a few pigs, and about 150 head of poultry. The usual allocation of boys to the various work tasks was as follows: gardeners, 27; tailors, 38; shoemakers, 42; carpenters, 6; painters, 6; laundry, 10; bakery, 4; kitchen, 7; stokers, 2; porters, 2. The band now numbered 28 members. One of the boys had an interest in photography which was said to be 'indulged to the utmost.' There was a good asphalted playground. and also a good playing-field for cricket and football, used on Wednesdays and holidays. On Sundays, a country walk was taken. Good military and physical drills were given. There was a good covered playroom for use in bad weather, and as it was heated was especially useful for the winter. There was a library, and papers were freely allowed. Indoor games were also provided. Concerts and magic lantern entertainments were organised from time to time, particularly in the winter. Occasional excursions were made (three in the summer of 1896). Boys with decent enough homes were allowed leave of 3 or 4 days. Visiting day took place once a month. Boys exhibiting god conduct were designated as monitors, sergeants and corporals and received awards of 2d. to 6d. a month. The money was banked for them and could be drawn out by the boys at leisure. Book prizes were awarded once a year, and money rewards once a month, for proficiency in the school room. On December 3rd, 1891, an Auxiliary Home for the School was opened at 81 Blackfriars Road, Lambeth. The provided supervised hostel accommodation for up to 45 for boys on licence who were endeavouring to find a livelihood for themselves. In 1893, an additional house at 83 Blackfriars Road was taken and fitted up with a reading room, and workshops for printing, book-binding, carpentry etc. There was also a gymnasium and a play-room, with baths and lavatory. The total accommodation was now 75 places. On April 17th, 1900, the Auxiliary Home transferred to 17 Westminster Bridge Road, Lambeth, where 53 boys could be accommodated. (From 1903, the address was given as 5 Westminster Bridge Road.) It was now described as being for boys from the St Vincent's School 'and others'. The Home was eventually closed on April 18th, 1913. In 1899, a junior section of the School was opened at Whitstable and run by the Sisters of Mercy. From 1899, Brother Louis was recorded as superintendent of the main School. He was succeeded by Brother De Sales on 1st July, 1907, with Brother Calasanctius (Rev. D.C. McSwiney) replacing him on 6th January, 1908. Brother Bruno then took charge on January 10th, 1911. In 1933, St Vincent's became an Approved School, one of the new institutions introduced by the 1933 Children and Young Persons Act to replace the existing system of Reformatories and Industrial Schools. The School could then accommodate up to 120 Junior Boys, aged between their 10th and 13th birthdays at their date of admission. The headmaster in 1935 was Brother C. Dunstan Curtin. In 1956, Brother De Montfort O'Sullivan was head. The management of the School was now in the hands of the Southwark Catholic Children's Society. In 1973, the School became a Community Home with Education (CHE) and run in conjunction with Lewisham London Borough Council. The Home is believed to have closed in the mid-1980s. The buildings no longer survive.